This mission would prove to be very difficult for Joseph. The opposition was great at that time in Great Britain with little receptiveness from the people. But Joseph continued to serve the Lord, handing out over 10,000 pamphlets and visiting over 4,000 homes in one month. While there, he did not baptize one single person. Following Joseph’s mission, he was hired to work at the Mormon Church’s Historian Office. This would lead to his appointment in 1906 as an Assistant Church Historian, wherein he assisted President Anthon Lund, a counselor in the First Presidency. He was later appointed as the Church Historian. While in that position, he had 24 volumes of his writings and sermons published. In 1910, Joseph was called to the Quorum of the Twelve Apostles, where he served as an apostle for sixty years. President Smith also held the position of President of the Quorum of the Twelve Apostles for nineteen years and five years as a counselor in the First Presidency. In April 1970, Joseph Fielding Smith was sustained as Prophet, Seer and Revelator of The Church of Jesus Christ of Latter-day Saints. At the age of 93, he was the oldest man to become the President of the Mormon Church. Hello, I loved this article but if the pedigree chart on the Smith family is correct that is in the Church History Library where I serve as a part-time Church and Family History Service Missionary then Julina Smith was the name of Joseph Smith Jr.’s daughter not his mother; this is an easy mistake to make I guess as Joseph Smith Jr.’s mother’s name was “Julia” Lambson (her maiden name). 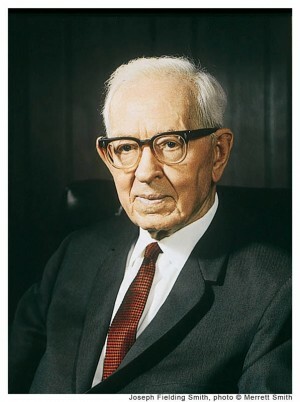 I was delighted and pleasantly surprised to hear that Bruce R. McConkie’s father-in-law was Joseph Fielding Smith Jr. I also loved hearing about how this wonderful Prophet of God was so dedicated to the Lord since a very young boy. It is truly an inspiring story about an inspired man of God. addendum: Was “louie” a nickname for his wife? I assume it was or it is a ‘typo’. I see his wife’s name on the family pedigree chart is Louise. oops, another typo….he married Louise Shurtliff in 1898 not 1808; hope this helps.